Carbohydrates contain carbon, hydrogen and oxygen. Their structure involves monosaccharides such as glucose and fructose which can form long chain polysaccharides such as starch or cellulose in condensation reactions (removal of water in reaction). 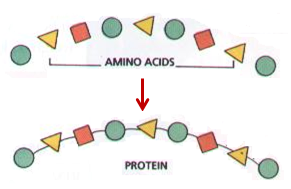 Proteins contain carbon, hydrogen, oxygen and nitrogen. They are made up of long chains of amino acids, which join together in a variety of orders. Lipids contain carbon, hydrogen and oxygen. They are composed of monomers of lipids, which contain fatty acids and glycerol. They form in condensation reactions, and can be broken down into their subunits in hydrolysis reactions.